The ringbelt is one of the most glamourous accents for any outfit, male or female. It has a certain rugged beauty that anchors any outfit. 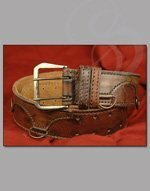 The ringbelt is made from thick, 8-ounce leather. It is 1 3/4 inches wide and 72 inches long. Yes, that's quite long. Fortunately, the belt is made to be snipped to the proper size. Features a large steel ring.